Meghan joins the science team from OSU as an undergrad working with Dr. McManus. She transferred from Carroll College in Montana as her interest narrowed more towards a career in chemistry than in the medical field, which influenced her decision to transfer to Oregon State University. She is currently working towards earning a B.S. in Chemistry, with a Forensic Option within the next few months. After that, she is considering pursuing further studies in chemistry-related fields, and possibly focusing on the marine environments. 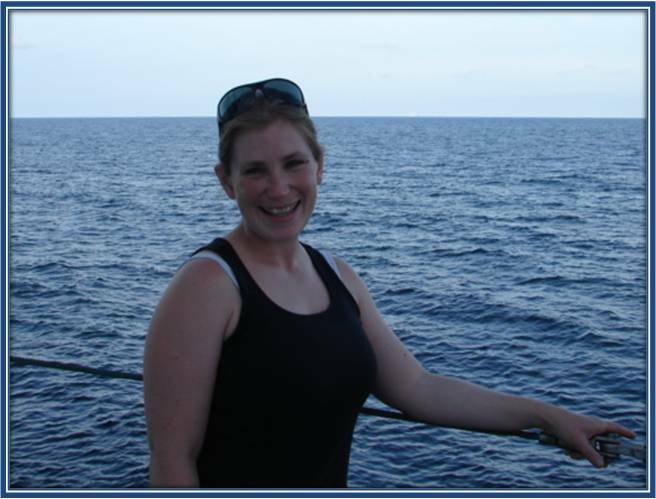 During this cruise, she will be using her previous experiences in the lab processing sediment and water samples for both study and storage until they can be analyzed further back on land. A: I have always been interested in science. Growing up, understanding scientific concepts came easily to me and I knew that was something I wanted to be involved with as a career. In high school, I had a really great teacher that helped me realize this was going to be a lifelong focus. Once I knew that, I narrowed it down to chemistry mostly because I felt it was more involved than biology, but less challenging as physics…right in the middle. A: I took the typical high school courses, nothing out of the ordinary. I didn’t like math very much in high school, but had a really great experience with calculus in college. Another course in college that was helpful in the lab, as well as landing jobs in this field, was Quantitative Analysis. Getting the experience with lab work early on will also prepare you for jobs with similar focuses. A: Definitely spend time with your professors and teachers; ask questions and get involved with the coursework. If you stand out in your professor’s mind, you will be among those that are called upon for field work opportunities and research. That is how I have ended up in many of these opportunities and aboard this ship today. Use the resources they make available, be it office hours or your advisor’s guidance, to your advantage.